Relatively uncommon and unheard of in the United States, the Italian Spinone breed is an ancient breed of Pointer and Retriever. The ancestry of this breed traces back to 500 B.C. The Italian Spinone was, and is, highly prized for their hunting traits and capabilities. The Italian Spinone breed possesses a noble demeanor and is impressive in stature. They are rugged, large, and distinctive. The Spinone is known for great strength and stamina. They are well suited for hunting on any terrain and all climates. 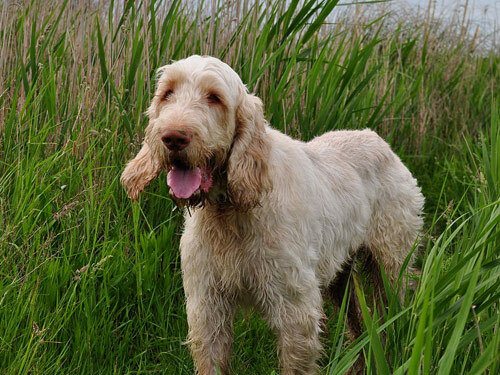 Italian Spinone's are a versatile breed well suited as hunting companion and family pet. The grumpy appearance of the Italian Spinone belies its affectionate and gentle disposition. They are very sociable, courageous, and loyal. They possess a somewhat independent nature, but can also be sensitive. The Italian Spinone breed does best best in a home with older considerate children. They get along well with other animals, particularly other dogs. This pleasant and easy-going breed thrives on family companionship. The Spinone is relatively difficult to find and is not suited for everyone. Italian Spinone's require a small amount of stripping to keep the coat neat and tidy. Weekly brushing will suffice. Bathing should only be done when necessary. The Spinone is prone to hip dysplasia and cerebella ataxia. The coat is thick, long, slightly wavy, and wiry. The Italian Spinone's hair is longer on the eyebrows, chin and lips where it forms a moustache and beard. The facial hair gives the Italian Spinone a kindly but gruff look. The Italian Spinone breed is a fast learner, but may be stubborn. Due to their sensitivity, the Spinone must be trained with firmness, fairness, and consistency. Motivational training works best. Early socialization and obedience training are recommended. The Italian Spinone is a slow and steady worker. They are not suitable for apartment living and do best in a securely fenced yard. Italian Spinone's thrive on human companionship and excel in lure coursing, agility, tracking, hunting, search and rescue, therapy, backpacking, assistance, retrieving, carting, and fly-ball.